Did you know it is considered “too much” or unhealthy actually, for the average woman to drink more than 2 glasses of wine a day, and for a man it’s three. That’s not much. In an effort to drink less, and drink healthier alcoholic choices, I’ve started looking at some healthy drinking alternatives. Fortunately, there are some awesome new products coming out that are lower in alcohol, lower in calories, and lower in carbs and sugars. I love that! 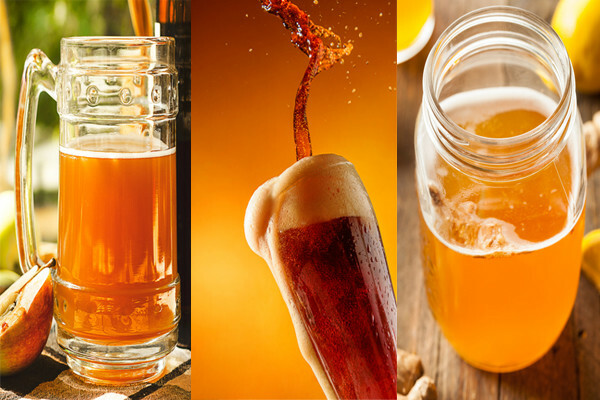 Let’s take a look at the new hard kombucha vs. cider vs beer vs. wine. Kombucha as we know, has lots of great health benefits. [Link to other kombucha article here]. Kombucha helps to populate your system with healthy bacteria, boost immunity, supply extra B vitamins, detox the liver, increase your energy levels, help fight cancer, and improve your mood. All good things! When regular kombucha is brewed, it contains a tiny bit of alcohol in it from the fermentation process. But now brewers have figured out a way to make kombucha with about 5% alcohol in it as well. A little more than the average beer, but still less than a glass of wine. So now you can get tipsy and still feel healthy? Pretty awesome right? According to Forbes magazine, kombucha is one of the fastest-growing beverages with sales estimated at $1.8 billion by 2020. So why not expand this success to ‘hard’ kombucha? When kombucha is brewed for a higher alcohol content, there is a secondary fermentation cycle added along with more sugar and a type of yeast. 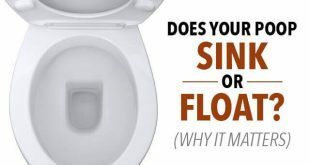 However, the yeast eats up all the sugar, so the sugar is 100% fermented, making a nice dry, low sugar/low carb drink with a little bit of a buzz. Some of the hard kombucha is actually sweetened with stevia, creating a hard kombucha a delicious, slightly sweet taste with very little sugar, carbohydrates—and decidedly low calorie! Kombucha also has health benefits other than probiotics, even in the higher-alcohol versions, the beneficial acids like acetic (the same beneficial acid in apple cider vinegar), lactic, glucuronic, butyric acid are all still there, along with B and C vitamins. Several hard kombucha brews have appeared on the market with alcohol from 3.2 to 8 percent. That puts them at the level of a beer (typically a 4.5 percent alcohol) and below a wine (typically 11.6 percent). The real question, however is can those probiotics even survive in that amount of alcohol? Probiotics generally don’t like alcohol, period. 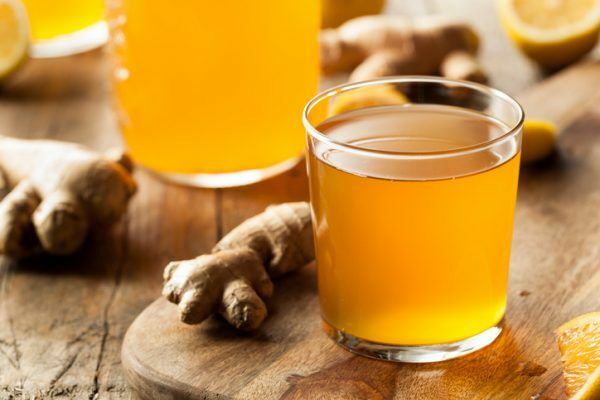 Some say there are not enough viable probiotics in even lower-alcohol versions, even though some kombucha companies are claiming that there are. Other independent lab testing of hard kombucha, ranging from 7 to 8 percent alcohol, has confirmed significant amounts of bacteria and yeast, gluconic acid and acetic acid that were comparable with what you would find in an average kombucha tea purchased at a store. But the bottom line is that hard kombucha is still booze, so if you overdo it, you are still drinking too much alcohol, although you may have less of a hangover. And if you are trying to cut back on alcohol, it may be difficult if you are a kombucha connoisseur, because these new boozy kombuchas taste delicious and refreshing! So, as the hard kombucha trend grows, we’ll be seeing it more and more alongside cider and other alternatives to beer. What about hard cider? It has often been offered as an alternative to beer, especially because most ciders are considered gluten free. 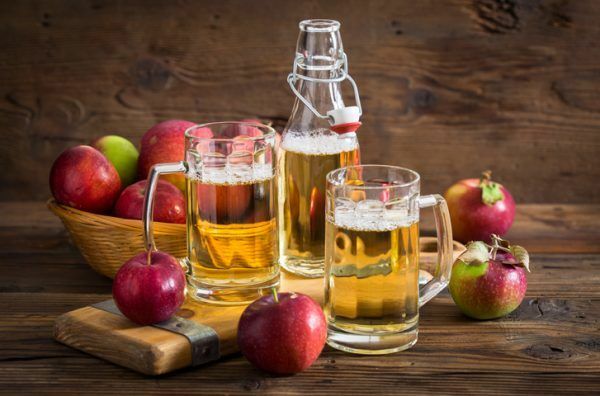 There are huge varieties of ciders available, some with astonishing amounts of sugar or corn syrup and other additives, while others are quite dry, low in sugar and low in carbohydrates, natural and/or organic. Hard cider is made by fermenting a combination of yeast and apples—a fruit known to contain vitamin C and other antioxidants. Cider often contains some of the phytonutrients that come from the apple skin as well. Some have confirmed the high levels of health-enhancing antioxidants in cider, similar to some of the benefits of red wine. A half pint of cider can deliver the similar amounts of antioxidants as a glass of red wine. Cider makers often boast that they are making a drink from a superfood, but it’s not all that simple. While whole apples may contain antioxidants, if they do not come from organic apples, they also contain plenty of toxic chemicals that comes from the spraying of the apples. Apples also contain up to about 65 percent fructose that is naturally occurring, but is still sugar as far as your body and your waist recognize. Sugar content of most commercial hard ciders can be staggering– up to 23 grams (7 teaspoons!) per serving in some cases. That’s a bit like drinking a soda! We all know that diets high in sugar are connected to obesity, heart disease, depression and cancer, making cider a questionable choice for drinking. While that may a ‘sobering’ fact, the key to choosing a healthier cider is to pick one that is labeled as “dry”. The sweeter ciders often have added sugars in addition to the sugar in the apple, while the dryer ciders allow the yeast to consume the majority of cider’s natural sugars and result in a less sweet drink with a higher alcohol content. That’s a win-win! Choosing a dry cider will help to keep your sugar consumption low while still enjoying an apple-y taste. Some of my favorite brands only contain a couple grams of sugar and are very low carb/low calorie. The craft beer market has totally exploded and new flavors and combinations of ingredients show up daily, so it’s hard to make generalizations about beer. 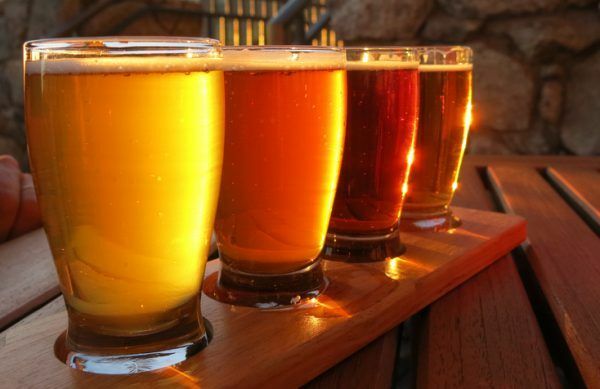 Beer is made from a combination of yeast, hops, barley, and other grains like buckwheat, corn, rice and sorghum. Yeast and water are added to the mix to start the fermentation process. Having a product made from grain can be slightly more inflammatory to your body, especially if you are sensitive to grains. If you are avoiding gluten, generally most beer is not totally gluten free, despite some of the labeling that says it is. Most gluten free beers contain small amounts of gluten. The purely gluten free beers are made of sorghum or buckwheat and are not usually as hearty or tasty as regular beer. Beer is generally thought of as a lower alcohol product but some beers can have as much as 8-9% alcohol—similar to a glass of wine. Beer is high in carbohydrates but generally not that high in sugar content. The IPA style beers have more carbohydrates than the average beer. A pale ale contains about 10-14 grams of carbohydrates, while IPAs can have up to 20 grams or more per 12-ounce bottle! So if you are trying to lose weight, cut carbs or calories, beer is not your best bet. Beer does not contain fruit juice (usually unless it is to flavor a craft beer and then it’s not much). Beer’s nutritional value looks a bit different from that of cider: Beer’s composition of yeast, hops, barley, and other grains that do contain a variety of different antioxidants and nutrients. Beer does contain some protein and vitamin B compared to wine or cider. While some beers may contain up to about 10% of the recommended daily intake of folate, drinking in general washes out B vitamins, so you probably are not doing yourself a favor by drinking it for the vitamin content. Naturally occurring polyphenols (usually found in hops and malt) are often removed since they can make beer cloudy. Compared to cider, beer contains less polyphenols concentration. However, a study by Oregon State University found that hops often contain flavonoids (a type of polyphenol compound), which provide antioxidant protection to cells . Beer’s health benefits extend to the heart too–Italian researchers found that the moderate consumption of beer reduces the risk of heart disease by 31 percent. Although beer is low in polyphenols, its nutritional value is bolstered by high levels of vitamin B, potassium and folate. Both beer and cider are pretty high calorie/high carb drinks, and cider usually contains loads of sugar too. Wine can carry an alcoholic punch of about 9-12 percent by volume, higher than most beers, and about twice as much as the new hard ciders and hard kombucha. So needless to say, you don’t need to drink as much. On top of that, studies show that a glass of wine hits your system more quickly, so it’s easier to overdo it. But wine is a delicious, crisp enjoyable alcoholic beverage and a classic! While alcohol itself contains calories, the sugars and carbs in alcoholic beverages also add to the caloric bottom line. A pint of beer contains more calories than most hard kombuchas, and some hard ciders (depending on sugar content). Most wine, especially the drier wines, have about half as much calories as beer, at about 85-100 calories per 6 ounce glass. Wine’s big advantage, however comes from the famous polyphenols from the skins of the red grapes. Many of the healthiest, longest living societies around the world—especially the Mediterranean drink wine and enjoy long, vibrant, healthy lives. Both red and white wines contain health benefits, with red edging slightly ahead in the antioxidants. A study of 25,000 European found that those who drank moderate amounts of wine (1-2 glasses a day), had a 34 percent lower risk of death from all causes—especially heart disease and cancer. It’s thought that the rich blend of polyphenols in the wine, combined with the healthy bacteria and yeasts contribute to the health benefits. 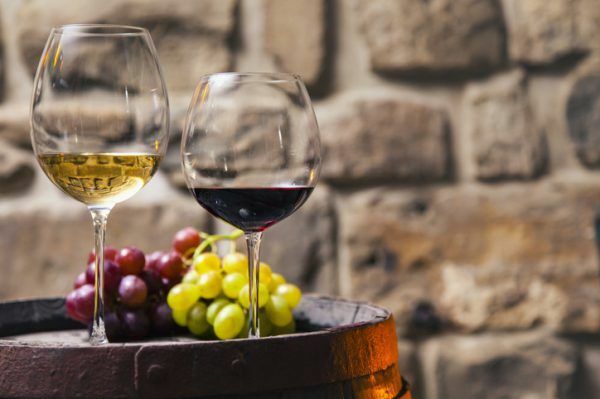 Since most of the polyphenols in wine come from the grape skins, red wine contains higher amounts of antioxidants, including resveratrol, than white wines, which does not include the grape skin. And natural wines—whether red or white—especially if they are unfiltered contains a beneficial blend of bacteria and yeasts that support a healthy gut microbiome and help your body absorb more zinc, magnesium, calcium and iron. One other thing to consider in hard kombucha, hard cider, beer and wine is how it is grown. Is it organic? We know that apples for cider are often heavily sprayed with pesticides, and the grains and hops in beer most likely encountered toxic glyphosate spray, if not organic. Grapes grown for wine can also be hit with toxic pesticides, so your best bet is to go with an organic wine. The new lower alcohol drink choices out there can be a healthier choice with lower alcohol content. The key is to buy organic, natural and low sugar, and shop wisely. And, with any alcoholic drink, moderation is the name of the game. One bottle of a low carb beer, a low-sugar cider, or a small glass of wine can provide a good dose of antioxidants and less alcohol, so learn to in moderation. Previous Lemons vs Limes, which is healthier?